For a long time I didn't use foundations at all. A bit of powder and I'd be good to go. I've never been a fan of the heavy feel that foundation leaves on your face. When I started using foundation I think I used Covergirl, then either the formula changed or my skin changed and it just wasn't working for me any more. I've never found one I was particularly happy with. The foundations that are currently in my makeup drawer were all purchased at around about the same time while I was trying to find a replacement for whatever my previous one had been. It's a bit too dark for my skin, gives great coverage but feels oily and heavy on the skin. I love the pump delivery system with this foundation. It seems more sanitary then other systems, but you can get dried out bits clogging the nozzle. 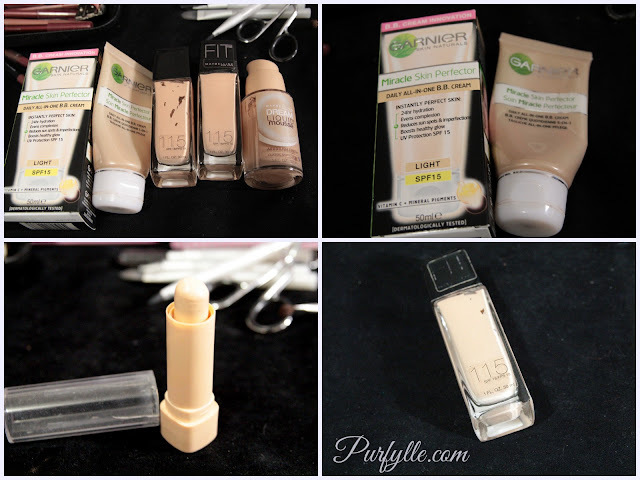 I'm holding onto this foundation for now because I'd like to give it another try, it's been a while since I've used it. It's a bit too pale for me at the moment, coverage is okay but it can be chalky. It feels nicer on the skin then the Dream Liquid. I obviously liked it enough to buy a second bottle. Now I think I would probably choose to wear the Dream Liquid over the Fit Me. Some features I find unsettling with this product are that to use it you have tip it onto your fingers or the back of your hand and it's simply not as sanitary as the pump or squeeze containers are. Also there are 'Drug Facts' noted on the label; the label which you have too peel off to gain access to the ingredients list which has been printed in super tiny type, all in caps, making it nearly impossible to read. I'm keeping the unopened one for now. This is was what I started using instead of the Fit me and Dream Liquid. It feels lighter on the skin, evens out my skin tone but doesn't give very good coverage. I've kept the others for those times when better coverage is needed. Lately I've been finding this formula is really oily on my skin and it's not working for me like it used to do. I like the squeeze tube container with it's flip lid. The lid keeps it from drying out and being able to squeeze out the amount I need to use helps to keep it uncontaminated. I think I'd like to look into some more traditional style BB creams. The formula of this is really greasy and it refuses to build up nicely and it just doesn't work for my skin at all. I can't remember how long I've had this but it's been far too long, I didn't hesitate to throw it out. I'm surprised to see that so many of these are Maybeline. They seem to have been the products that have swatched well for me in-store and are within my budget so I've bought them. The hunt is on now for something I'm truly happy to wear on my face. I hate shopping for foundation, the sales staff pounce on you and the hard sales pitch begins, which generally just scares me out of the store altogether. 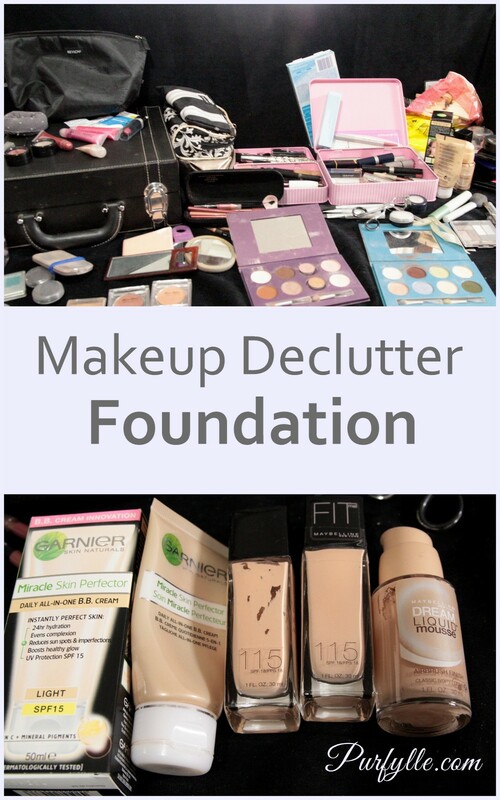 What do you use for your foundation? What products should I hunt down and try out? I've heard that Drew Barrymore's makeup range, Flower, is going to be released in Australia this year and that the foundation wears really well. I'll be keeping a look out for it's arrival in stores. I hate foundation too. I literally feel like I'm smothering. Have you ever tried or even heard of BareMinerals?? Since it's not liquid, its supposed to not feel as heavy. I can't keep track of what day it is, there's no way I could manage to keep track of how much stuff I've decluttered. I've never come across a 'mineral powder' that was pale enough for my pasty white skin or that did a good enough job of covering up face demons. But the reality is that most makeup is made up of minerals and it's best to be careful of any 'magic ingredient' claims. That's why I stuck to just powder for as long as I could. Last time I was taking a look the girl suggested a CC cream (because I'd asked about traditional BB creams instead of the tinted moisturiser things we get that are labelled BB creams), but I had to rush off. I think I'll have to take a look at CC creams next shopping trip. I've realised that my moisturiser with sunscreen was to blame for a lot of the problems I was having with oiliness and foundations braking down, so I'm going to have to find a new moisturiser. I look sickly if I use just foundation, I need to add a little colour to my cheeks at the very least.